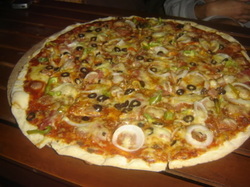 Probably the best-tasting and affordable thin crust pizza here in Bacolod City. Compared to the other large-sized, thin crust pizzas, Greeno’z pizzas have 2 times more toppings. Very affordable. Prices range from Php99 (regular – 9 inches) to Php845 (XXL – 30 inches). Bacolod seems to be in a HUGE. The Bigger the Pizza, the better. 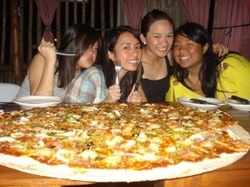 People in Bacolod want good value for their money which is why giant pizza chains in bacolod have thrived. 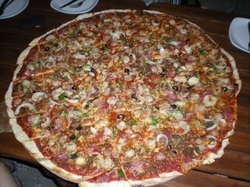 Greeno’z is one of the Pizza chains in Bacolod serving gigantic Pizzas. Perfect for parties and drinking sessions.